Fame is an odd thing. Many world leaders, diplomats and American politicians would have a difficult time getting a private meeting with the prime minister of Israel. But a 17-year-old Canadian kid with blond hair and a talent for entertaining pre-teen girls has no problem getting face time with Benjamin Netanyahu. That is, until Justin Bieber refused to meet with children living in communities affected by Gaza rocket fire. So it sounds like the Bibi-Bieber Summit is off. Bieber was slated to meet with PM Bibi Netanyahu tomorrow evening in Israel. Netanyahu's advisers invited a group of children from communities near the Gaza border to attend the meeting with Bieber. In fact, last week these children got off their school bus just before it was hit by a Hamas rocket. A teen was critically wounded in the incident. Israeli new website Haaretz is now reporting that Bieber, who's been under constant camera fire from the Paparazzi in Israel, is refusing to meet the children, which led Netanyahu to cancel their meeting. If you're like me, you're probably wondering not only how a 17-year-old kid gets a meeting with the Israeli prime minister, but also how he rebuffs the prime minister's request for a PR moment. I can only identify two of Bieber's songs and those are the ones that my children sing around the house. However, I certainly understand the allure. These teen sensations pop up every few years. After all, to paraphrase Paul Simon: "It's every generation throws a teen hero up the pop charts." But there must be something more about this Justin Bieber. No matter how famous they became, I don't think Justin Timberlake, Britney Spears or Christina Aguilera ever had a peace summit with a foreign leader. And they certainly didn't manage to get dis-invited the way Bieber just did. While I don't see Justin Bieber becoming the next Bono and jetting off to far away nations to lobby government leaders or address Congress, I do think Netanyahu knew what he was doing by setting up the meeting and then promptly canceling it. Bibi was going to use Bieber's fame and cache among the world's youth to both showcase Israel and demonstrate the realities of life in Israel amid rocket fire from Gaza. But if the young pop sensation didn't want to play ball, the deal was off. Bibi didn't block out an hour from his busy schedule because he needed advice from Justin Bieber or because he wanted to look cool to Israeli youth by posing for photos with their teen idol. 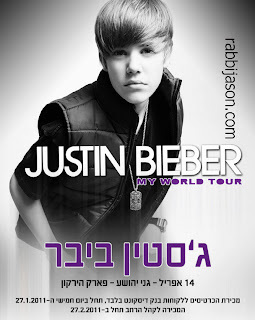 Bibi was exploiting Bieber's fame for what's known in Israel as hasbara -- propaganda. If Bieber wasn't willing, I'm sure Bibi can find someone else to do it. A 17 year old with that much power is an issue all on its own!